I wrote this post in the Spring of 2018 in collaboration with the lovely hair artist, Roxie Jane Hunt. 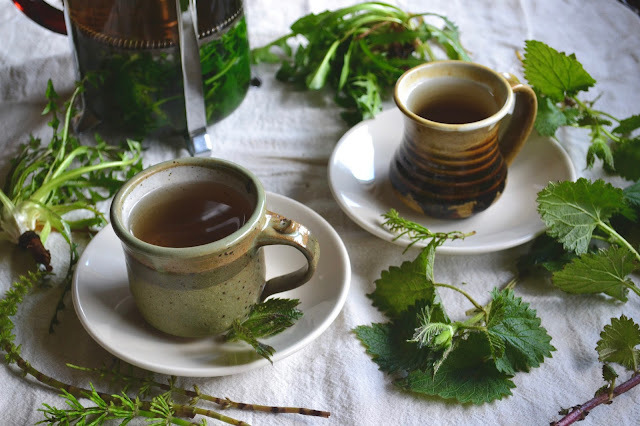 Be sure to continue reading below to see the recipe for this foraged tea and also how Roxie braided fresh nettle leaves into my hair. Yes, I actually said that. Enjoy! 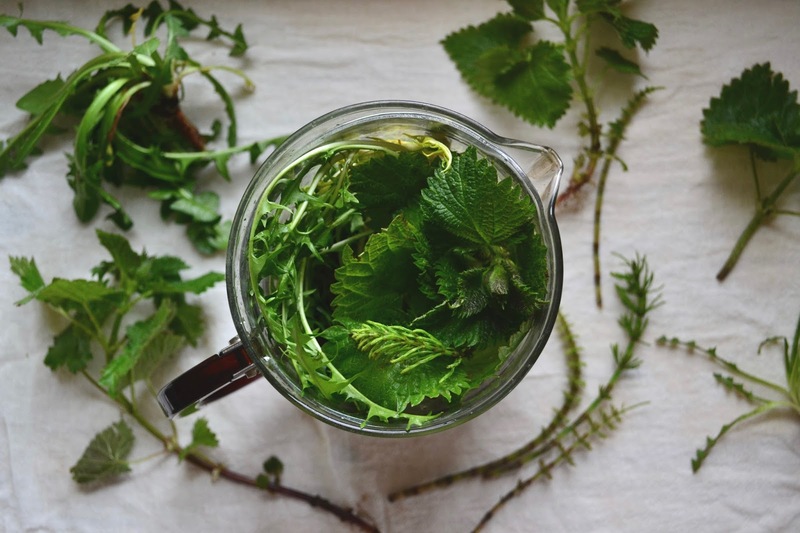 It is the time of year in the Pacific Northwest when the earth is waking from her winter slumber and vibrant green medicinal wild plants are once again emerging from the soil. This is the time of year that our skin and hair crave and need extra nutrients from mineral-rich green plants to restore vibrancy and shine. Of course, you can go to your local apothecary, health-food store, or the internet to purchase dried forms of these medicinal herbs. But something must be said for the potency of the medicine that is growing right outside our front door. Responsible foraging can be a wonderful way to connect with the earth and the medicine she provides for our bodies to thrive. 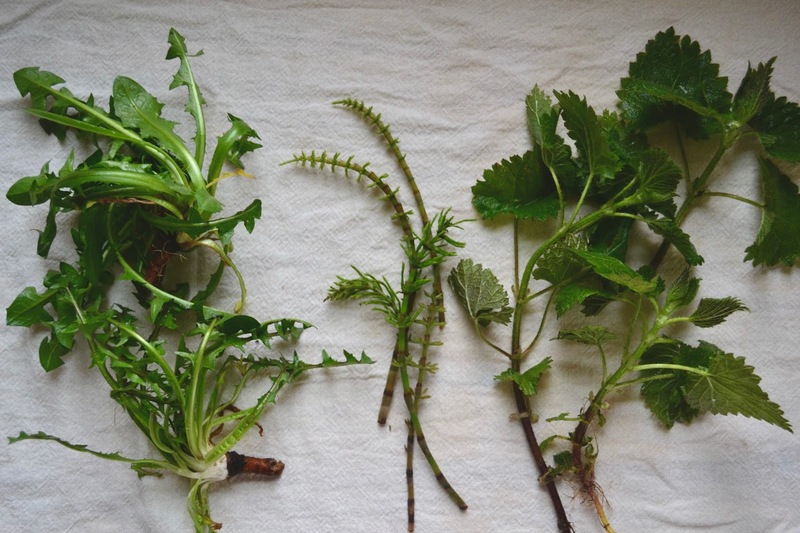 When gathering edible plants, some important rules apply. First, be sure you are using a field guide written for your particular bioregion so you are identifying plants correctly. Always be sure you are gathering from areas that are not sprayed with pesticides, herbicides, or other pollutants. Steer clear of areas where dogs frequent, so avoid harvesting too close to a pet-friendly trail. Always make sure the plants you are foraging are not endangered and be sure to harvest in a way that is not harmful to their population. Only pick what you plan to use. And finally, one of my favorite grounding practices is to always ask permission from the plant before harvesting. If permission is granted, offer a statement of gratitude to the plant for all of the medicine it provides. Continue reading for the recipe for Beautifying Herbal Tea on Roxie's blog and to see my hair braided with fresh nettle leaves. I grew tomatoes in my garden last year for the very first time. I remember going to the local plant nursery in late spring and spending literally hours agonizing over which tomato plant varieties I should buy for the newly constructed raised bed in our backyard. Would I want lots of cherry or grape tomatoes? Red ones or yellow ones? Green zebra striped heirlooms or San Marzanos? Beefsteak or Roma? I wanted them all, but I knew we only had room for about eight plants. And so, I settled on eight little plants whose tags promised varying sizes, shapes, and colors of tomatoes come late summer. Fast forward through a summer filled with lots of watering, staking, pruning, mulching, stressing over, and fawning over those tomato plants to now. In late autumn, my tomato plants were just about done producing fruit for the season. I cannot say for sure if I think my crop yield was worth all of my time, money, effort, worries, and love I put into those plants. But what I can say is that the satisfaction of making this roasted tomato soup using all of my very own homegrown tomatoes certainly was. 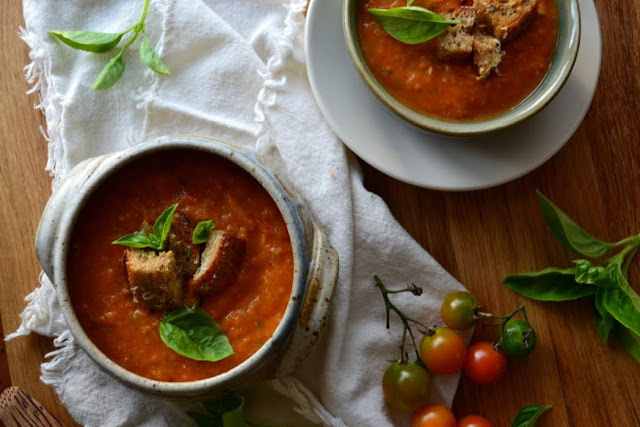 Use any variety of tomatoes you have for this soup. Big ones, little ones, pretty ones, or ugly ones. They can be super ripe or not quite ripe yet. You can’t really go wrong. Instead of adding cream or milk (like many tomato soup recipes do), this recipe uses the addition of creamy, protein-rich cannellini beans. So for all you dairy-free folks, this one is a keeper. And do make the garlicky croutons. It’s totally worth the extra few minutes. Preheat oven to 375 degrees. Cut the large tomatoes into wedges, the medium sized tomatoes in half, and leave cherry-sized tomatoes whole. Arrange them on parchment-lined baking sheets in a single layer. Peel and slice the onion and arrange the slices over the tomatoes. Peel the garlic cloves and add the whole cloves to the tomatoes and onion. Drizzle everything with olive oil, sprinkle with a generous pinch of salt and toss to coat everything. Bake in the oven for about an hour or more until the tomatoes start to get wrinkly and the onion is starting to caramelize a bit. When the tomatoes are nicely roasted, remove them from the oven and let them cool a bit. Transfer them to a soup pot, along with any juices that collected on the pans. Drain and rinse the cannellini beans and add them to the pot, along with the basil leaves. Using an immersion blender, blend the soup until it is creamy, adding water or broth a little at a time until you reach your desired consistency. Taste and season with salt as needed. Bring soup back up to a simmer to warm it up and serve topped with croutons (recipe below), torn basil leaves, and a drizzle of olive oil. Preheat oven to 375 degrees. Chop the garlic very finely and put it in a mixing bowl. Add the Italian seasoning, about 3-4 tablespoons of olive oil, and a generous pinch of sea salt. Stir to combine. Cut the bread into 1” cubes. Add them to the oil mixture in the bowl and toss to evenly coat the bread. Arrange the oiled bread cubes on a parchment-lined baking sheet in a single layer. Grate Parmesan cheese over the cubes to give them a nice dusting. Bake them in the oven for 15-20 minutes, tossing them halfway through the cooking time to promote even toasting. Remove from the oven and let cool a bit before adding them to the soup. I'll never forget the time I met Deborah Madison. She was on her book tour for Vegetable Literacy in Seattle and I got to hear her speak and get my book signed. Her books hold special places in my heart and are well-loved. It's amazing how many ways she can create beautiful new vegetable recipes that still manage to inspire after all her years of recipe development. Truly, an inspiration. This dish is such a special one. Lovingly braising the fennel brings out so much flavor and aroma. It is my absolute favorite way to prepare fennel. Top it with a poached egg or two to make it a beautiful meal. 2. Halve each bulb lengthwise and cut the halves into wedges about 1 1/2 inches at the widest part. 3. Heat the olive oil in a wide sauté pan (I used my gorgeous new Dutch oven that I got for my birthday) over medium-high heat. When hot, add the onion and fennel seeds, crumble in the saffron and thyme and then cook until the steam releases the color from the saffron, after several minutes. 4. Add the fennel wedges and cook them until golden, turning them and the onions occasionally. Once they are well colored, add the garlic, stir in the tomato paste and then add the stock and 1 teaspoon salt. 5. Scrape the pan to release the juices, then cover and simmer until the fennel is tender, another 15 minutes. Before serving, stir in the butter and taste to see if it needs more salt and pepper. Avocado toast is one of life’s simple pleasures, and it also happens to be super easy to make and very healthy, too. Avocados are packed with potassium (more than in a banana) and vitamins and have been shown to help reduce inflammation. Here, I use the fruit to make toast three different ways, transforming a simple snack into a feast for senses. So the next time you have some ripe avocados on hand, try one (or all) of these variations. Toast the bread. While the bread is toasting, mash the avocado in a small bowl with a pinch of salt. When the bread is done toasting, top with the mashed avocado. Sprinkle with hemp seeds, chopped herbs, and tomato halves. Serve at once. When the bread is done toasting, top with the mashed avocado. Top with radish slices and micro greens or sprouts. Serve at once. When the bread is done toasting, top with the mashed avocado. Top with smoked salmon and small dollops of sour cream. Sprinkle with capers and fresh dill. Serve at once. For the longest time, I was intimidated by the tomatillo. I regularly shied away from it at the market. It just wasn’t a vegetable I was very familiar with. Something about those papery skins turned me off. It seemed like a vegetable that probably didn’t taste all that good since, to me, it looked like it was never ripe. It wasn’t until I realized that salsa verde, that pleasantly refreshing condiment at my favorite Mexican restaurant, was made from those pretty green vegetables that always show up at the farmers market this time of year. I was determined to make something with this new-to-me vegetable in my own kitchen. Soon after, this soup was born. And it has become one of my favorites. I’m already coming up with other ways to use the tomatillo because it is my new best friend. Chop the onions, tomatillos, jalapeño, and garlic. In a large pot over medium heat, add two tablespoons of olive oil and cook the onion with a pinch of salt until it’s beginning to soften. Add the tomatillos and jalapeño. Stir occasionally until the tomatillos begin to soften, about 7 minutes or so. Add the garlic, cumin, and enough pasole cooking water to just cover the vegetables. *Note: If using canned pasole, use water or broth of your choice in place of the cooking liquid. Using an immersion blender, blend the soup until it is almost smooth. Bring the pureed soup back to a simmer and add the chicken thighs. Cover and cook 20-30 minutes or until the chicken is cooked through. Turn the chicken once or twice during that time to encourage even cooking. While the soup simmers, chop the cilantro finely. You may also include chopped cilantro stems, as well. When the chicken is cooked through, remove the thighs from the pot and shred or cut them into small pieces. Return the chicken to the pot, along with the chopped cilantro and the strained hominy. Stir well to combine and allow the cilantro to wilt a bit. If the soup is too thick, add more cooking liquid, water, or broth to your desired consistency. Taste and add salt as needed. Serve the soup garnished with avocado, cilantro, sliced radish, lime, cotija cheese, and crumbled tortilla chips. When I started this blog over five years ago, I was a vegetarian and had been for years before that. Like many vegetarians, I avoided meat because I felt it was healthy to do so. It wasn't that I didn't enjoy meat as a child or that I was a staunch animal rights activist. I simply just wanted to be healthy and live longer and had read that a vegetarian diet would help me achieve that. And for many years, my vegetarian diet served me exceptionally well. I was a competitive long distance runner throughout high school and college who rarely, if ever, got sick. I learned all about vegetarian cooking techniques. I worked in vegan juice bars, cafes, and a vegetarian kitchen of a huge health food co-op. I ate what I thought to be a picture perfect diet full of colorful vegetables, fruit, legumes, whole grains, nuts, and plant-based fats. All was well. Until it wasn't. I felt that something was missing and my hormone levels were way out of whack. After about 8 years of being a vegetarian, I slowly began incorporating high quality animal products like pastured poultry and grass-fed beef into my diet. I still ate primarily vegetarian, but adding just a bit of meat started to make me feel better and balanced and strong. It also greatly improved my severe cystic hormonal acne that I was suffering from. I got pregnant when I was 24 and throughout my pregnancy, I ate exactly what my body craved. Luckily, I craved healthy whole foods (which included meat) and lots of them. I had a healthy pregnancy (with perfect glowing skin throughout! ), a natural uncomplicated birth, and a beautiful baby. All was well. Until it wasn't. The stress and exhaustion of having a baby took it's toll on many aspects of my health and wellbeing. Heck, it still does! But what I have noticed is that adding mineral-rich bone broth to my already healthy whole foods diet really helps in a variety of ways. I make the broth from bones I buy at the farmers market. Grass fed beef bones, pastured chicken bones and chicken feet all make my broth exceptionally rich and nourishing. Broth was the first food I gave to my daughter and she still loves it. It has become an important part of our diet, in addition to all of the beautiful produce, legumes, whole grains, eggs, and meat that we eat. 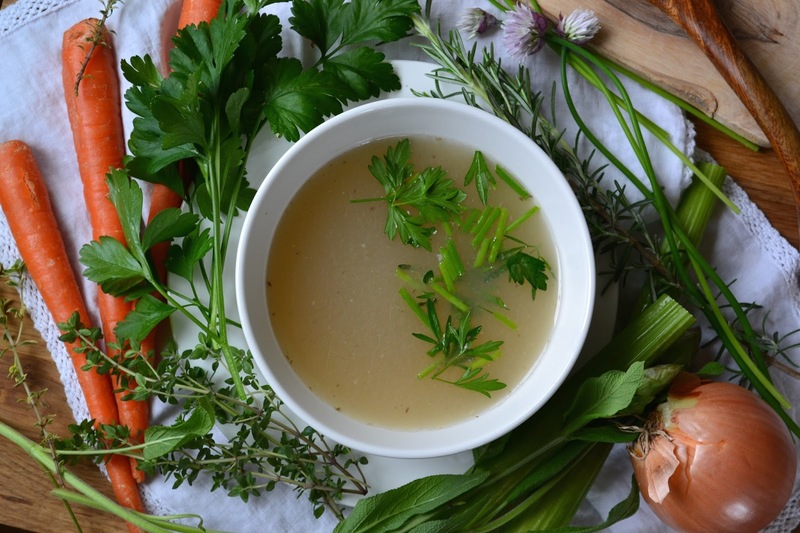 I don't need to go into all of the insanely amazing health benefits of bone broth here. You can read that from many other places in far greater detail than I could write here. All I can say is that bone broth has changed my life (something I would have laughed at during all those years as a vegetarian) and I wouldn't have it any other way. I encourage you to give it a try. I totally get that spring is almost over and summer is right around the corner . I don't really expect you to make this granola right now, but here's the thing. When autumn rolls around, pumpkin spice everything pops up everywhere. And honestly, it's easy to overlook recipes flavored with the spices of pumpkin pie when every other food blogger is posting recipes about said spices. So do yourself a favor and bookmark this incredible granola recipe for the fall before your overwhelmed with pumpkin spice recipes. You'll be so glad you did. Preheat oven to 350° F. In a large mixing bowl, combine pumpkin puree, honey, coconut oil, pumpkin spice and salt. Add the oats, pecans and almonds. Stir well to evenly coat the mixture. Pour the granola mixture onto a parchment-lined baking sheet and bake for 30 to 35 minutes, or until the granola is golden and crunchy. Stir the mixture once or twice while baking to encourage even browning. Remove from the oven and add the cranberries. Allow the granola to cool completely before storing in an airtight container at room temperature. Goodness gracious, it has been far too long since I've written here. In the past six months, we've moved to a new house, travelled across the country twice, said goodbye to a few dear friends and family members, welcomed new beautiful friends into our lives, and overall just grew emotionally and spiritually as a family of three. My little Hazel is turning two(!) in less than a month and I am constantly in awe of how she grows and changes daily. Life is magical. I've been meaning to share this incredibly simple and tasty treat with you all for awhile now. These almond butter cookies whip up in literally less than five minutes and they are completely grain-free and refined sugar free, as well. They're a perfect snack for a toddle and an especially lovely snack with a cup of tea while said toddler naps. Do let me know if you make them, and next time I do, I just may add some dark chocolate shavings to them. If you asked me what my favorite food was when I was six, the answer would have been macaroni and cheese. If you asked me again at age sixteen, the answer would still be macaroni and cheese. And if you ask me now at age twenty-six, I would still say macaroni and cheese. What has changed over the years is how often I consume my favorite meal. The truth is, I hardy ever eat mac and cheese anymore. I have so many other (far healthier) foods that I love that I just don't feel the need to make it at home. Also, coincidentally, my husband hates (and I mean HATES) mac and cheese. So that's another reason why it's never on our dinner table. Recently, I've thought more about my favorite childhood comfort food as I sit and watch my daughter devour a bowl of lentil soup. Or wolf down dried seaweed and lacto-fermented sauerkraut. My child will never know what neon-colored Kraft macaroni and cheese tastes like (not if I have any say over it, at least) and the foods that she has been exposed to at her ripe old age of sixteen months are completely different from what I grew up with as a child. And that's a good thing. Don't get me wrong, I have nothing against the real deal mac and cheese. Homemade gooey deliciousness made with high quality cheese and milk. There's a time and place for that. But this time, I decided to introduce my daughter to mac and cheese in a new way. A vegan way. 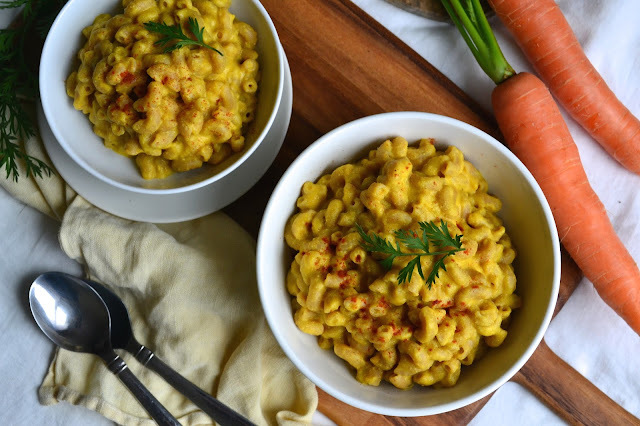 Made with whole whole wheat pasta and a super flavorful creamy sauce that just so happens to contain vegetables without a hint of milk of cheese. It's not the "real deal" but it's an absolutely excellent alternative that I truly believe even the die-hard mac and cheese lovers with adore. I remember the first time I had matcha. I was a health-nut freshman in college. 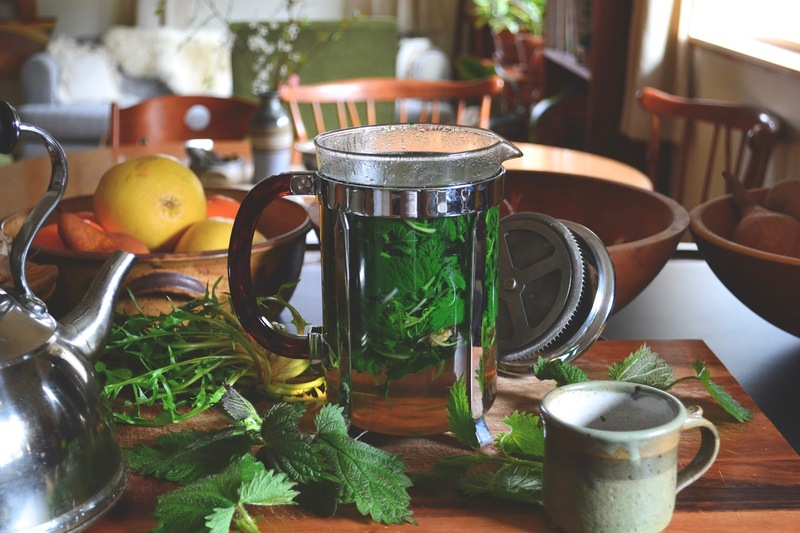 My dorm room was full of various types of tea, vitamins, and herbal tinctures. I had sworn off drinking coffee, unlike the rest of my peers, because it made me feel awful. I was craving a cleaner source of caffeine and knew that matcha would be perfect. Being the tea connoisseur that I was, I knew the health benefits of matcha tea, and I wanted the best quality tea I could afford. So I did some research and decided to spend a small fortune for a two ounce tin of ceremonial grade matcha tea straight from Japan. Yeah, I was that college student. Spending her money on matcha from Japan instead of beer at the bar. The package arrived from Japan about two weeks after I had ordered it and immediately, I ripped it open. The tin was wrapped in layers of Japanese newspaper that I kept and hung on my wall. The moment I opened the tin and saw the intensely green powder, greener than any food I had ever seen, I was immediately in love. The taste was sweet and grassy, not bitter at all, and the feelings of mental clarity and wellbeing that resulted from that first cup made me a matcha drinker for life. Since that first cup of matcha in my dorm room, the powdered green tea has become increasingly popular. Matcha lattes, matcha ice cream, and matcha baked goods are everywhere. And to be honest, I haven't tried any of it because I'm a purist and I like my matcha the traditional way. But since matcha has become trendy (and so have chia seeds) I knew that combining the two in a simple pudding would be a small (and healthy) step towards stepping out of my comfort zone that many people would enjoy. I still prefer my warmup of matcha tea, but this chia pudding is pretty great, too. but better late than never, right? Enjoy. Before I had Hazel, our dinners were often times pretty elaborate. I was always trying complicated recipes from my big collection of cookbooks, using lots of new and exciting ingredients. The dishes piled up without any worries. Vegetables were cut with precision, cooked to perfection, and everything was timed just right. Meals were savored with slow, uninterrupted conversation until whenever. There were no babies to be nursed, bathed, and rocked to sleep. It was quiet. Life has changed dramatically from those days of quiet dinners. Now, it's all about simplicity. But health is never compromised. In an effort to make life easier, I make large batches of whole grains and roasted vegetables in the beginning of the week and use them in these "bowl meals" throughout the week. Each time I make a meal with the grain and vegetable, I try to add something different and fresh. A handful of beans, some toasted nuts, a leafy green, a sprinkling of fresh herbs, a hefty spoonful of kimchi. Anything, really. It keeps everything from becoming boring and it makes me feel less like I'm eating a bowl of leftovers. In this particular case, I had made a large batch of millet and roasted cauliflower and carrots in the beginning of the week. A scoop of millet and vegetables combined with some marinated tempeh, massaged raw kale, and some fresh herbs turned into a simple and healthful meal in practically no time. Hazel even enjoyed it. I hear that many of my east coast friends and family are dealing with somewhat of a heat wave and are anxiously awaiting the arrival of cool autumn weather. Sorry guys. All I can say is to enjoy the heat while you can! 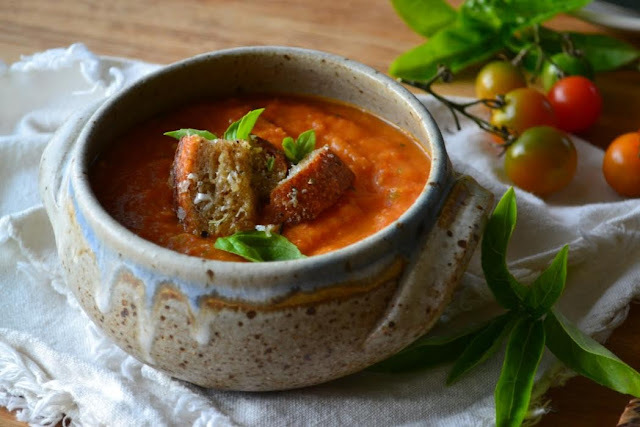 And what better way to use up the end of season tomatoes and melons than to make this yummy gazpacho? I know it's not totally seasonal, but I wrote this recipe almost two months ago when we were in the middle of a heat wave. And I'm just getting around to posting in now. Oops. This whole motherhood thing really gets in the way of my usual scheduled blog posting, I tell ya! Anyway, if you'd rather be making a roasted squash soup and a pumpkin pie at the moment, I totally understand. Just make this gazpacho next year. Happy Fall! Feeding a toddler is tough. There, I said it. It's messy. Extremely messy. Wasteful. Oh so very wasteful. And, if you're a perfectionist like me, it's time consuming. You see, I have a real issue with processed foods. I hardly ever buy anything processed. Yet the snacks targeted at babies and toddlers are all super processed, even if they are organic. And while sometimes, I do cave and give my daughter a store-bought pouch of pureed organic fruit when we're on the go, I refuse to give into purchasing the onslaught of convenience foods targeted at busy moms and hungry babes. I make Hazel's snacks myself. I've made muffins, healthy cookies, trail mix, smoothies, and these incredible raspberry crumble bars. Or I give her whole foods, such as a piece of fruit, berries, seaweed, veggie sticks, and cheese. I'd rather know exactly what she's consuming instead of relying on a snack company's ingredients. I still have a lot of improvement to do in regards to planning ahead and trying new snack recipes. Sometimes, Hazel is super hungry and the only easy snack food I have on hand is a banana. And while that's perfectly fine, I'd like to get a bit more creative before she starts getting tired of bananas. She's also still nursing, so I do have the convenience of offering the breast when she wants a snack on the go. Gotta love breastfeeding! These bars really are incredible, though. We ate them far too quickly. And the chia jam was absolutely perfect on toast with almond butter. I highly recommend making the bars with the whole vanilla bean, pod and all. You (and your toddler) won't be disappointed! How is it the last week of August? Today, there's a slight coolness in the air and the clouds have an autumn feel to them. The ground is damp from a much needed rainstorm. Instead of welcoming the season change and the temperature drop with open arms, I feel sad. That's my feeling today. Also exhaustion. Intense exhaustion that cannot be put into words. But somehow, I managed to cheer up a bit when I meandered the farmers market this afternoon. I picked up these beauties seen above, plus a whole pastured chicken and a half flat of blueberries. We'll eat well this week. And I'll be happy again. Pasta with Basil and Carrot Top Pesto- I've made a version of carrot top pesto before and blogged about it here, in case you're interested. This time, I'm leaving out the wild leeks. I'll probably serve this with a simple tomato salad. Roasted Chicken with Fingerling Potatoes- My body has been craving animal protein lately and I'm listening to it. So I bought the highest quality chicken I could find and I'm going to use every part of it. I'll serve it with lots of braised kale. Chicken and Wild Rice Soup- The celery and carrots from the market are going to make this soup even better. I'll also throw in a bunch of fresh parsley and use the celery tops for extra greens. Quiche- I'm thinking a classic spinach and gruyere version with lots of caramelized onions. Served with steamed broccolini. Herbed Lentils and Roasted Eggplant- This recipe is one of my favorites from Plenty. And I have all the ingredients on hand to make it at the moment, so it's happening. Zucchini Bread- I'm still on the search for a really good zucchini bread recipe. One that is Hazel approved. Zucchini Fritters- My favorite zucchini recipe of all time. How have I not blogged about this recipe before?! Note to self: photograph those fritters! Gazpacho- The weather has been unseasonably hot in Seattle and I've really dreaded cooking on those steamy hot evenings. Gazpacho is perfect for those. Eggplant Caponata- I was thinking of experimenting with a vegan eggplant rollatini recipe this week, but that would be a little too time consuming. Caponata is easier. Here's a recipe that I made in Italy that I'll use. Fried Eggs and Garlicky Sautéed Kale, with Tomato Basil Salad- So simple. Pasta with Kale, Tomatoes, Olives, and Beans- One of my go-to quick meals. Gluten-free pasta with loads of veggies. Peach, Berry, and Plum Crisp- I'm thinking a similar version of this recipe. What about you? What are you making with your farmers market finds? Of if you're super lucky, your own garden's bounty? I'd love to know! You guys. This recipe. Make it now. That is all. Ok but seriously. You'll never need another brownie recipe again, I promise. Now I know that there are lots of black bean brownies floating around out there and I can't speak for them. But these are the ones you need to make. They're vegan, grain-free, refined sugar-free, and they're friggin incredible. Lately, I've been into savory breakfasts. There's something about starting my day off by eating vegetables that makes me feel better about myself and somehow makes me feel more inclined to eat healthy throughout the day. My little girl loves soft boiled eggs, so I usually cook up a bunch early in the week for her (and me) to eat in a pinch. These eggs in particular from the farmers market had some of the most beautiful orange yolks I've ever seen. I always have some sort of cooked grain on hand, so this savory bowl comes together in the same amount of time as a bowl of oatmeal. The cherry tomatoes and basil are incredible this season, so all of these things combined with some creamy avocado makes one of my favorite summer breakfasts. Give it a try sometime. I have a thing against convenience foods. Since becoming a health food nut many years ago, I've given up convenience foods. Anything that's processed and packaged just isn't my thing. The exception lies in those super healthy convenience foods, and trust me, it's got to be super healthy if I'm going to eat it. I'm thinking of perhaps a raw organic energy bar. Or some yummy whole grain gluten-free crackers. Or a portable packet of nut butter. The ingredients have to be pure, otherwise I'm not touching it. We recently traveled to New York to visit family (the reason for my blogging absence lately). Traveling on a plane with a one year old is rough, man. It's exhausting in so many ways. But I was prepared with as many healthy snacks as I could to get me through because for me, if I'm well nourished, then I can pretty much do anything. For our five hour flight, I packed fresh fruit, kale chips, homemade trail mix, some organic dehydrated raspberries (the baby loved those), and these Lara bars. The bars were the first snacks to be eaten. I've made different versions of these 3-ingredient bars and my favorite combo so far is pecans, almonds, medjool dates, and the all-star (not so) secret ingredient; a whole vanilla bean. Yup, put the entire vanilla bean (pod and all) in the food processor with the rest of the ingredients and trust me, your life will be changed forever. Ok, maybe not, but you get the point. We celebrated a special little girl's first(!) birthday last week and it was such a happy day. Words can't really describe how I've felt about this first year of motherhood. All I can say is how truly incredible it is to see Hazel grow and change and develop. It's amazing. The night before Hazel's first birthday, as I nursed her to sleep in my arms, I cried. A lot. All the emotions just flooded through me. This year, I felt like I was broken into a million pieces and now slowly I'm being put back together, but in a different way than before. Not sure if that makes sense, but it's how I'm putting it into (inadequate) words at the moment. I had always wanted to bake a really special cake for Hazel's first birthday. A pretty one. And a healthy one. And I think I succeeded with this one. It's really a vegan version of my popular super moist banana bread recipe with dark chocolate added to it and it's covered in a coconut cream frosting. I topped it with some fresh berries. I tripled the cake recipe below and doubled the frosting recipe for the party and had enough to make one 8" double layer cake and about 18 cupcakes. 1. Preheat oven to 350 degrees. Rub coconut oil in two 8" cake pans. Set aside. Combine the chia seeds and water in a small bowl and stir well. Set aside to gel about 5 minutes. 2. In a large bowl, combine the mashed bananas, coconut sugar, coconut oil, and vanilla. Add the gia gel and stir until incorporated. 3. In a separate bowl, mix the flour, baking powder, baking soda, and salt. Add the dry ingredients to the wet ingredients and stir very well. Now is the time to add chopped chocolate and mix to incorporate. Pour the batter in the oiled cake pans. Bake for about 35-45 minutes, or until a butter knife inserted in the middle comes out mostly clean. Let cool completely (preferably overnight) before frosting. 1. Refrigerate the cans of coconut milk at least 4 hours (overnight is probably best) in order to separate the coconut milk from the water. 2. Once the coconut milk is chilled, gently open the cans and scoop off the coconut cream into a mixing bowl. Reserve the water for smoothies or other recipes, if desired. Add the maple syrup, vanilla extract, and vanilla bean seeds to the bowl with the coconut cream. With an electric hand mixer, mix until the frosting is fluffy and creamy. It won't get as fluffy as dairy whipped cream, but it should be smooth.